Since Suzu had lived with a single male owner, it was hard for her to get used to the environment of ARK. We can’t blame her for that; there are a lot of cats and dogs, many people come and go, and it’s always noisy. 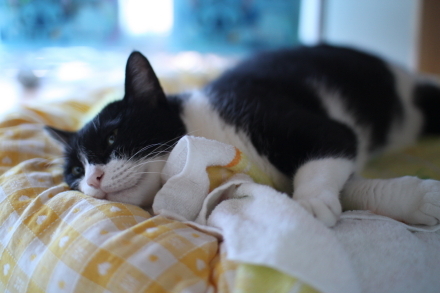 Her feelings are natural for a cat who has mostly lived quietly by herself. She had to stay alone in a tiny room for a while. She couldn’t move in to the relatively spacious shared cat enclosure because she doesn’t like other cats and didn’t get along with them. We aren’t sure if this was the reason, but we found something that looked like a rash on her belly. She had a lot of bumps all over her belly, like the bumps you see on massage slippers. According to a vet’s diagnosis, there was a possibility that she had tumors of the mammary gland and she might survive only six months. She wasn’t close to people at ARK, but to our surprise, she became close to the staff member who took her in; she meows when she comes home and asks to be petted. She eats anything and can stay home by herself for hours at a time. She easily gets used to friends or visitors. We never imagined this when she was at ARK. Those tumor-like bumps disappeared! The vet said she doesn’t have a tumor and the cause of the bumps is unknown; it could be just an inflammation of the mammary gland. We saw the vet two months later and the vet said she’s all right. I wonder what happened to her. Was it herpes caused by stress? I think, however, she could have ended up with malignant cancer if she had stayed in the stressful environment of ARK. 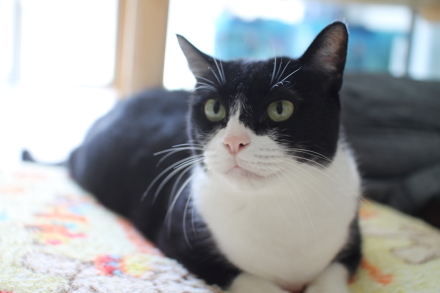 After many twists and turns, Suzu is no longer a cat that isn’t adoptable because she may live only six months. Instead, she’s a cat that’s easy to live with, and would be a good partner. We’d recommend her to single people, couples who have given up on having dogs because both have a job and are out of the house all day, or people who just want a calm, adult cat. Please call us before you visit ARK if you wish to see Suzu. The staff member who is looking after her will bring her to ARK to see you! We hope everyone had great autumn long weekend. We had a great weekend at ARK. We had all kinds of people here; some to adopt, some to volunteer, and others to bring donations…so many visitors! We apologize to everyone who had to wait or didn’t have enough time to get information or speak with us because of the shortage of available staff. It was so crazy that we weren’t even able to answer the phone when it rang! We also have wonderful news. A lot of animals were adopted over the weekend! Anzu and Ume, who were abandoned in front of ARK right after they were born, left with their new families. Our staff members looked a little sad when these two kittens left. 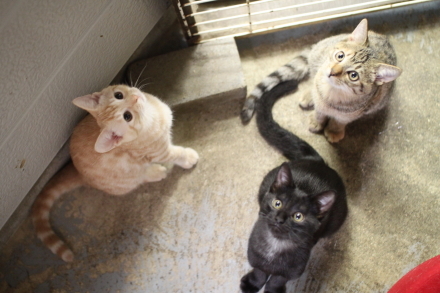 The kittens had special needs, so staff had taken turns skipping sleep to make sure they got the care they needed. Of course they’re happy that the kittens have found new families! 2009.06.18　The Kittens are Growing Well!! 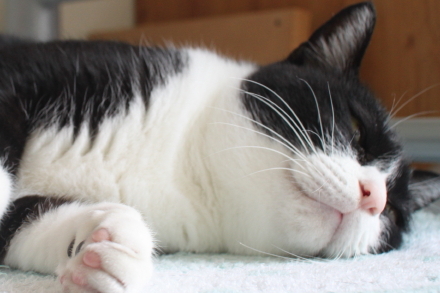 The long weekend is over but we truly hope that all the other animals get adopted as soon as they possibly can. This is a report from one of our regular GREEN DOG Adoption Events. This time around, many people brought items to donate. We’d like to take this opportunity to express our appreciation to everyone for their support. Thank you very much! We will use all the donated items with care for our ARK animals. Poo was scheduled to participate, but was adopted, so Mitchy took Poo’s place. 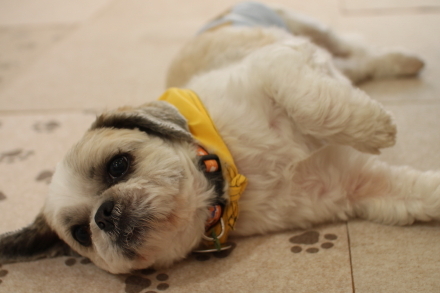 shows Mitchy tired out by the time the visitors arrived. scaring easily and only allowing certain staff members near her, and so being difficult to introduce to potential adopters, but she completely changed that perception at this event when everyone saw how relaxed she could be. We also thought that she disliked men, but she was able to leave the staff’s side and wander close to people she was interested in. She even ate treats that were offered to her. Before coming to ARK, Mika was living with a homeless person in a large family of 31 other dogs. Perhaps she was overly protected as she was living in a storage container box. Chame (female, pictured above right) always seems to be getting scolded by her older sister Mei, who joined the family after her. After hearing about their daily routine, and listening to stories about their diet and hospital visits, we truly understand how loved they are. Mei, who has a chronic illness, seemed very energetic, which is all thanks to her adopter’s abundant love. 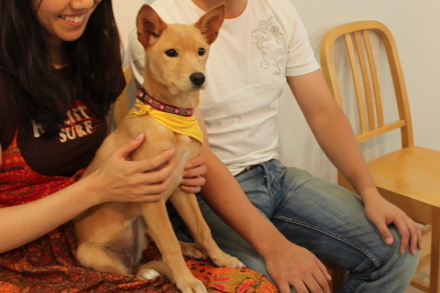 Although Sakura (female) always has her grooming done at GREEN DOG, she was a bit scared. Sakura’s two older human sisters saved up their allowance to buy clothes for the ARK animals. Wearing clothes that those two so thoughtfully bought will help the animals prepare for the coming cold winter. Thank you so much! 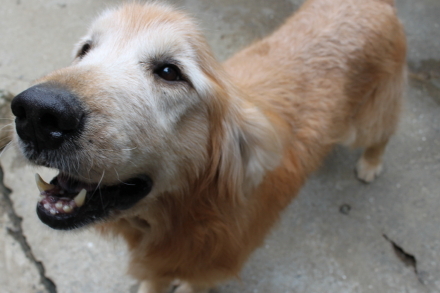 Just as you have found happiness, we’ll strive to find happiness for more dogs. It was unexpected that such a cute, active pup who gets along well with other dogs, couldn’t find a new home right away, but destiny has brought Bona this wonderful mom and dad. Cats Ume and Karin participated in this event. We had planned to bring their sibling Anzu too, but she had tummy troubles, so she stayed behind. The stress and fatigue of moving around seemed to affect the two cats at first, but they gradually started to relax. Once everyone started paying attention to them, they had fun playing. Before we realized it, they had even eaten. Ume, are you lounging on top of Karin? Who was it that had earlier been hiding under a cushion? Lusty was scheduled to participate, but was adopted, so Al took his place. Oops! That’s still a secret…! 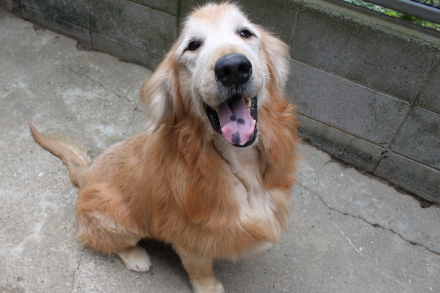 Al the Golden Retriever was taken in together with his brother Leo. Last month, Leo left ARK with a very kind new mother. When Al arrived, he had filarial worms and bald patches all over his body. When he was examined, we found out that hypothyroidism was the cause, but you can see that now that he’s on medication, he’s nice and fluffy. Al is friendly, cheerful, and well-behaved. Feeling a little lonely, however, he desperately wants to make friends and expresses this with his whole big body and spirit. Whenever one of the staff walks by on the path, he follows and calls out to them. As soon as he has finally settled down, someone walks by again and he gets excited. Our hearts ache for him. One of the hardest things I have found about being at ARK is when rescued dogs and cats pass away at ARK without ever finding a family of their own to love them. Al has filariasis, and takes medicine for hypothyroidism. He’s a large, older dog with an illness. We must find someone to adopt him soon. 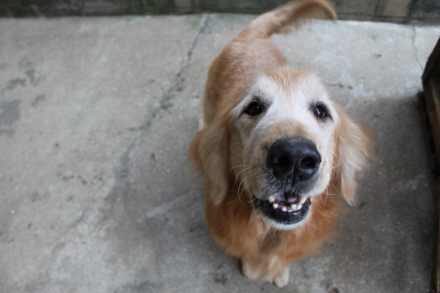 As I was driving yesterday, I saw several elderly golden retrievers out on walks. Will Al see the day when he can relax and be a normal household dog like them? Another article about pet issues will be published in the September 7th issue of AERA (on sale from September 1st). The 3rd article continues with these themes. We hope you will purchase the magazine and send your feedback to the editorial desk. We would like to encourage them to keep monitoring the pet situation in Japan and write more articles about it. You can also vote for your favorite article by clicking on it (like a popularity poll). You also can post your comments on the AERA blog. Below is a quote from the AERA blog (URL above). Thank you so much for reading AERA and for your important feedback. It has been a long time since the last article was published. I have recently written an article entitled ”No-kill Dog Rescue Common Sense in Germany,” which will be published in the August 31st issue of AERA (the front cover is scheduled to feature the head of the Democratic Party of Japan, Yukio Hatoyama). While gathering the information for the article, I was impressed by the German system of not killing a single dog, and finding out why no dogs are sold in pet shops. Meanwhile, I look at the situation in Japan, which is a kind of hell in comparison to Germany. I’m also writing about certain organizations/groups calling themselves “rescue shelters for abandoned dogs” that do not make it clear if they are for profit or non-profit, and the horrid conditions dogs are kept in by such organizations/groups. Is it impossible for Japan to undertake similar activities to Germany? I would like those people involved in animal welfare and the government to read this article and to think about the possibilities. We at AERA will continue gathering information on this topic.